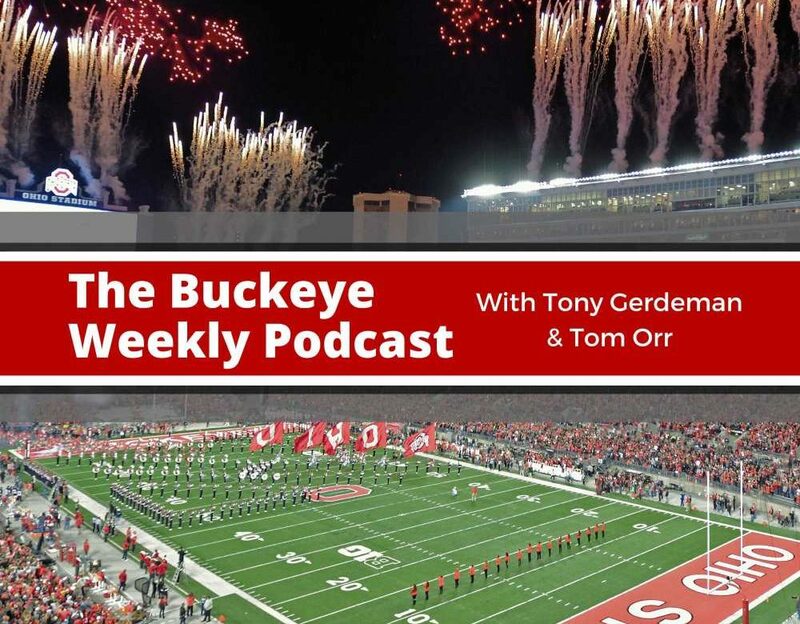 In this episode of the Buckeye Weekly podcast, Tony Gerdeman and Tom Orr talk about Urban Meyer’s decision to retire following the Rose Bowl. Why now for Meyer? Ryan Day will take over on January 2. Is he the right guy? Would the Buckeyes have been better served by having a national search? The fellas also discuss how fans need to recalibrate their expectations moving forward. + Kind of a selfish move on Urban Meyer’s part. + Next week’s show will be special in its own right. + Meyer didn’t want to be a distraction to recruits or this podcast. + Why now for Urban? + Were we surprised that he retired? + The signs were all around us. + Tom loves ‘Blossom’ and British royals. + Urban thought about stepping down back in 2014. + We could have head coach Tom Herman right now. + Imagine covering OSU head coach Tom Herman this past year with the Zach Smith tweets. + Thank you for toughing it out in 2014, Urban. + It’s easier for Urban to move on because things are going well. + What if the Buckeyes would have lost a couple more games this year, does he step aside? + If they lost to Michigan this year, he’s definitely coming back. + Delegation had its drawbacks this year. + What will you remember more fondly — 7-0 against UM or the national title? + Winning a national title is easier than beating your rival seven years in a row. + The national scribes are throwing out there hit pieces as expected. + Real Life Wednesdays is his legacy. + His legacy is also the infrastructure left for Ryan Day. + There are no home run hires sitting out there waiting for OSU’s call. + This was the most Urban Meyer hire possible, however. + Matt Campbell should have been looked at? + You don’t know what Campbell’s program does at Ohio State. + There are more knowns with Ryan Day and Urban Meyer than there are with Matt Campbell. + This wasn’t a great coaching pool, but Day is still the safest option. + How much did the 2011 season hurt Luke Fickell’s chances? + Meyer’s losses are more memorable than his wins. + The pundits don’t think Urban is done coaching, but he sure sounds like he’s done. + Meyer sounds like he’s going to stick around Ohio State and be an ambassador. + Meyer wasn’t even living up to fan expectations of late, so how can Day possibly live up to them? + Give Ryan Day some time. + Don’t expect him to be Urban Meyer because he isn’t. + Twelve wins a year is the new normal, but it’s ABnormal. + Don’t lose track of what OSU was before Urban Meyer. + Would it be terrible if Ryan Day is only as good as Jim Tressel? + If you want to be miserable all the time, go be an Alabama fan. + Urban Meyer’s last five years is the standard that Day will be held up against in his first five years. + The standard for beating Michigan is to have a winning record, not 7-0 or 9-1. + If Ryan Day loses to Michigan next year, he probably should be fired? + Jerk move by Gene Smith not to give us a coaching search? + Tony didn’t get to write his “Bobby Petrino to OSU” rumors. + Every year, teams should draft coaches. + Do we really wanna live on Rocky Top? + When did Ryan Day know he wanted this job? + Does an Ohio State coach need to grow up in Ohio to get OSU-Michigan? + Don’t you think Day gets the rivalry now after two years with Urban Meyer? + Buckeye coaches should be tested on how Ohio they are. + Tom now understands why he didn’t get the job. + What does this mean for the players? + This probably won’t be enough to bring Nick Bosa back. + What does this mean for Tate Martell? + Sneakpeaking the quarterback battle in 2019! + By the way, Ohio State won the Big Ten Championship Game just a couple of days ago. + Talking to Matthew Baldwin about the quarterback battle on the horizon. + What does this mean for the coaching staff? + He ain’t a’gonna start firin’ people now, so just cool you pants. + Who are the safe assistant coaches right now. + What does this mean for recruits? + Plenty of recruits have reaffirmed, but one has decommitted. + The recruiting process now with two head coaches. + What should we expect from the players in the Rose Bowl. + This could be as close to a flawless game as we’ve seen. + Let’s not get started on Georgia right now because the show is over. + Time to break out the Urban headbands and red Pony cleats. + Should Urban wear a fedora? + Has sneaker technology improved in the last 30 years? + Oh hey, Dwayne Haskins is a Heisman finalist.